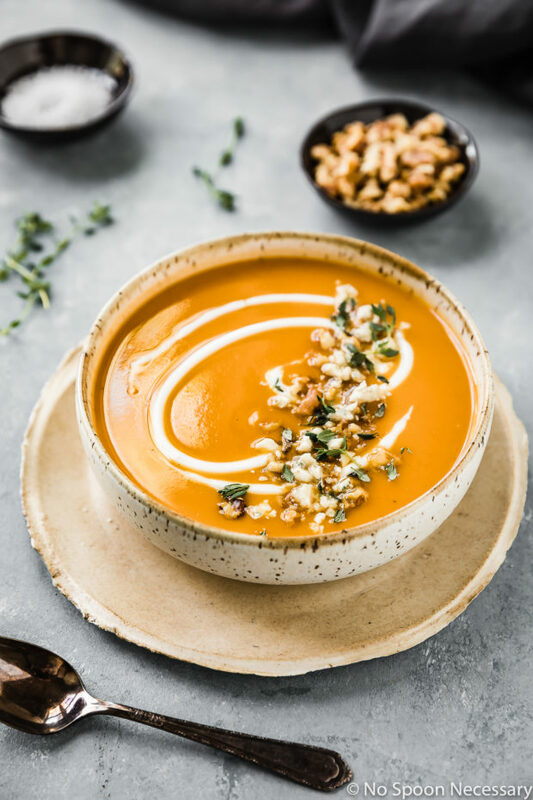 This Honey Roasted Sweet Potato Soup is velvety smooth and hearty, yet healthy and light. 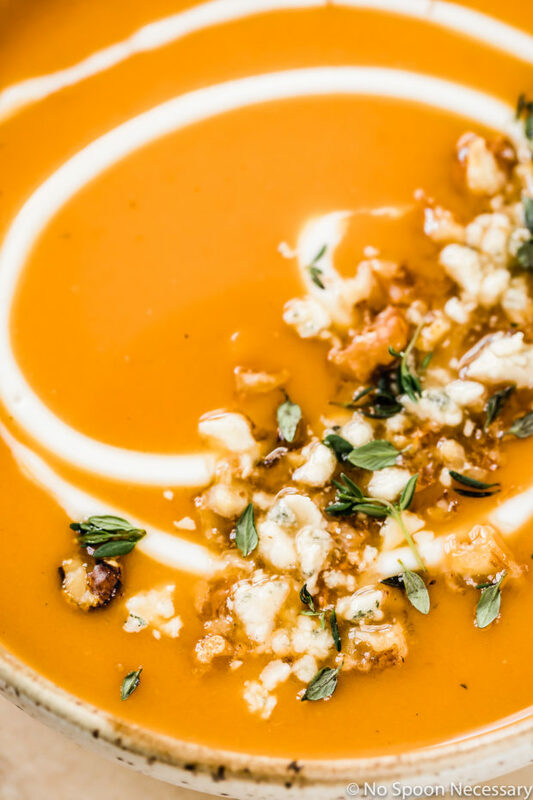 Garnished with funky gorgonzola, fresh thyme and crunchy walnuts, this warming soup packs tons of flavor! 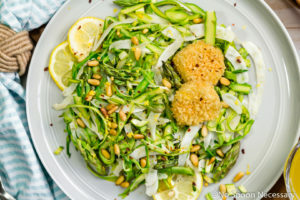 This post was originally published in February 2018. 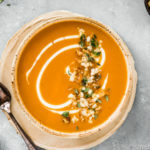 I edited the photos and updated the post below to include more information about this roasted sweet potato soup. Plus, I added a recipe video to show you how easy this comforting soup is to make! I hope everyone had a wonderful Valentine’s Day! 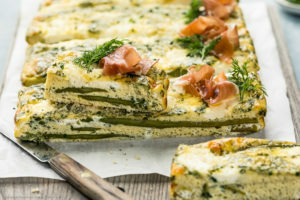 Whether you celebrated it with a significant other, friends, family, or you simply celebrated stag, I do hope it was marvelous and filled with a generous amount cocktails, elegant eats and sweet treats. With the holiday dedicated to love (and bubbly. And sprinkles) now in the rear view mirror, we can get back to ALL things cozy and comforting. And by cozy and comforting, I mean SOUP. Lots and LOTS of soup. 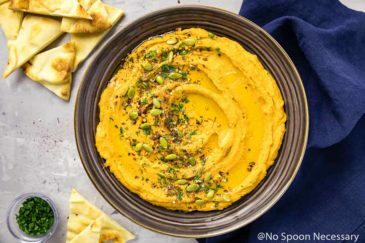 This sweet and savory soup has a depth of flavors, with caramelized sweet potatoes and subtle notes of citrusy orange, pungent red onion, mellow garlic and warm ginger. Creamy and smooth this honey roasted sweet potato soup is luscious and velvety in texture. 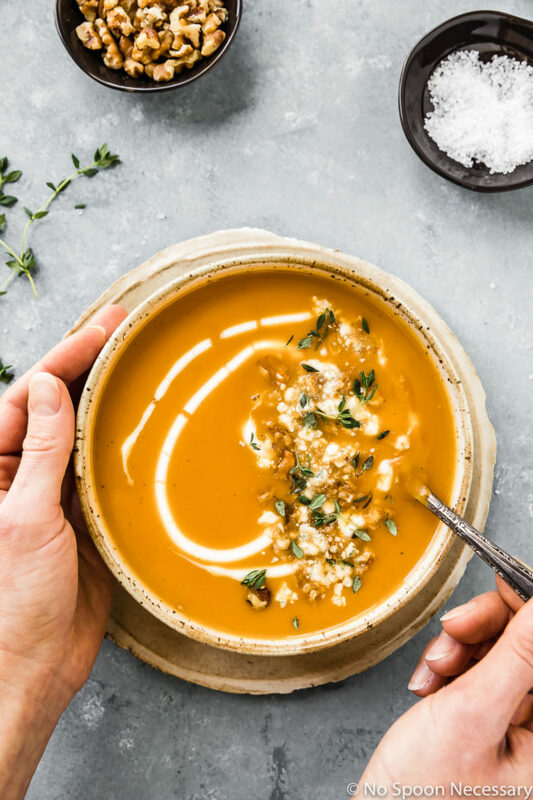 Garnished with earthy, fresh thyme, funky, crumbled gorgonzola, and crunchy walnuts, this soup is rockin’ all the cozy, yet healthy vibes. What goes with sweet potato soup? 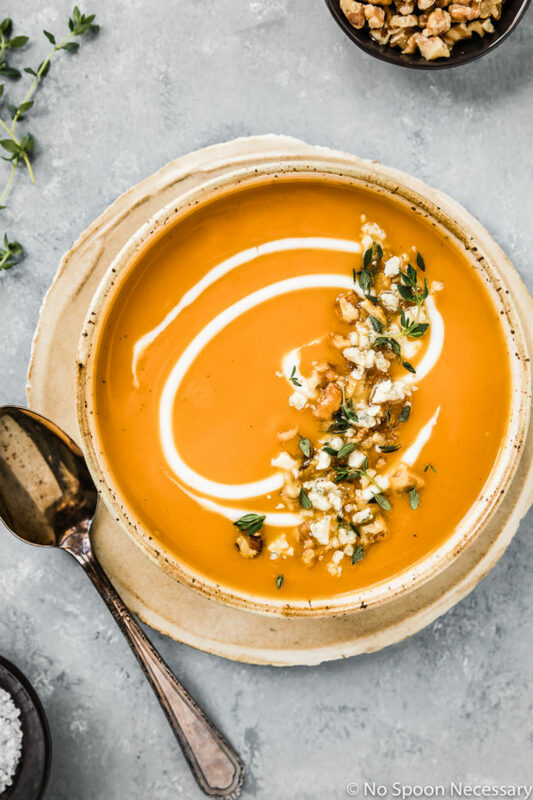 While this honey roasted sweet potato soup definitely eats like a meal, a small side salad is always a great pairing option with soup! A peppery arugula salad would couple well with this mellow, sweet and savory soup. 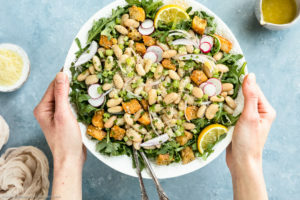 If you are looking for a nutritional boost, bitter swiss chard or massaged kale are also great options for greens. And, whatever do you, don’t skimp on toasted, crusty artisan bread for dipping! Can you freeze sweet potato soup? You can absolutely freeze this roasted sweet potato soup. Generally, potatoes will fall apart when freezing and yield a separated, chunky consistency when defrosted and reheated, but since this soup is pureed, it freezes well, and can be kept for up to 3 months! Just make sure you do NOT add the crème fraiche to the soup until just before serving. 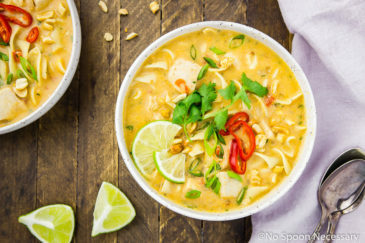 When freezing soups, always make sure you allow the soup to cool completely before freezing and do NOT overfill the airtight container, as liquids expand when they freeze. 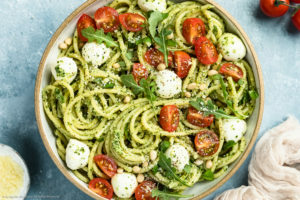 When you are ready to reheat to soup, either defrost the container overnight in the refrigerator, or place the container upside down under hot tap water to release the block of soup. Next, place the soup in a medium saucepan, cover, and cook over medium-low heat, stirring occasionally. Make sure you add stock, broth or water to thin the soup if necessary. To cut down on prep time, skip peeling and dicing the sweet potatoes yourself. Instead purchase the pre-peeled and diced container of sweet potatoes in the produce section of your market. While the recipe calls for chicken (or vegetable) stock, you can substitute broth if desired. The only difference is that using stock will yield a richer flavor and fuller mouthfeel due to the gelatin. When roasting the potatoes, make sure you use TWO sheet pans to prevent overcrowding. If you overcrowd the diced potatoes they will steam instead of roast and caramelize. Also, make sure you rotate the pans, front to back and top to bottom half way through cooking for even roasting. 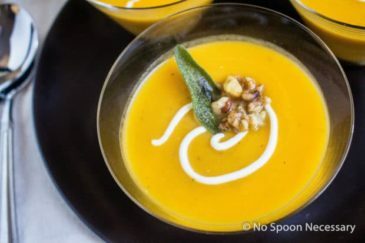 You can either use an immersion blender to puree the soup (which is the quickest and easiest method), or you can use a standing blender. If using a standing blender, make sure you blend the soup in batches! Fill the stand blender less than halfway, remove the lid’s center insert and hold a kitchen towel over the top when blending to prevent explosions! If freezing the soup, make sure you do not stir in the crème fraîche until just before serving! 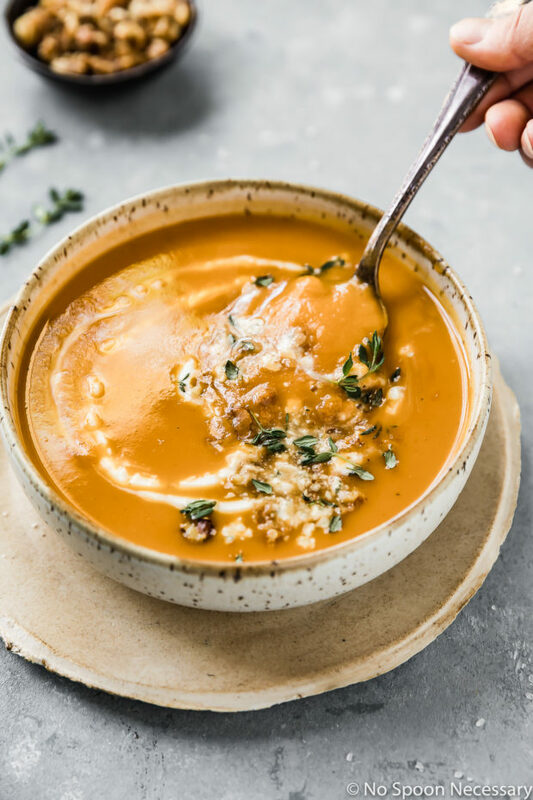 Sweet, savory and impossibly creamy-dreamy, this Honey Roasted Sweet Potato Soup is hearty, yet healthy and jam packed with cozy vibes! Until next time, friends, cheers – to soup for the soul. 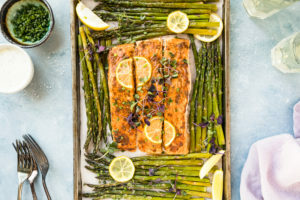 Preheat oven to 375 degrees F. Line 2 large rimmed baking sheets* with non-stick aluminum foil for easy clean up. 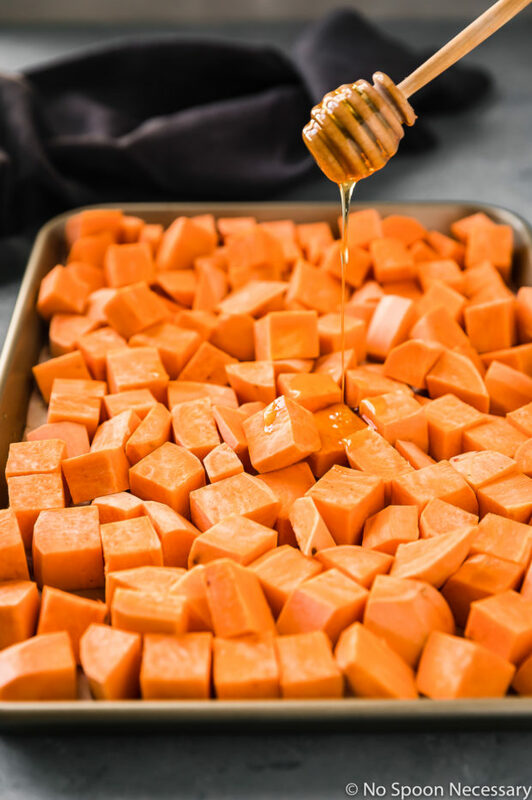 Roast the potatoes: Spread the sweet potatoes evenly, in a single layer on baking sheets. Drizzle with 1/4 cup of the oil and honey. Season generously with salt and toss to coat. Roast, rotating pans from front to back and top to bottom half way through, for 25-35 minutes or until tender and lightly browned. For the soup: In a large pot, heat the remaining 2 tablespoons of oil over medium-high heat until shimmering. Add in the onion, garlic and a generous pinch of salt and pepper. Cook until just tender, about 3-4 minutes. Add in the ginger and thyme, and cook until fragrant, about 30 seconds. Add in the roasted sweet potatoes and stock. Increase the heat to high and bring to a boil. Immediately reduce to a simmer and cook for 10 minutes, or until the vegetables are cooked completely and very tender. Add in the orange juice and stir to combine. Using an immersion blender, or standing blender, blend the soup until smooth*. Stir in the crème fraiche (if freezing skip this step*). Taste and adjust for seasoning with salt. 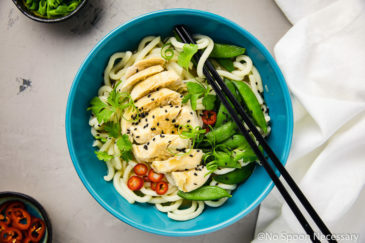 Serve: Ladle soup into serving bowls. 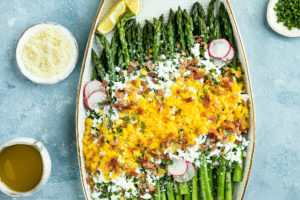 Garnish with a dollop of crème fraiche and sprinkle with walnuts and gorgonzola. Enjoy! So easy to make and so perfect for fall and winter Chey! I love the addition of the OJ and the yummy toppings! Delicious work, as usual!